Fast Company is tracking developments in the increasingly intense competition between Facebook, Google, Apple, and Amazon to show just how fast the big four are creeping into each others’ spaces. Here’s what changed in the 30 days since we published The Great Tech War of 2012. Check back often. • Pondering the “industry’s next Steve Jobs” we thought it was “…Steve Jobs.” Now a peek into an upcoming never-before-aired interview with the man himself revealed how he created things: “Designing a product is keeping 5,000 things in your brain, these concepts, and fitting them all together in kind of continuing to push to fit them together in new and different ways to get what you want.” Can any one else do that? Can Tim Cook? At least he’s made his mark on Apple already, as this week’s new board members prove. • “All these patent suits could stifle innovation,” was our accusation. Samsung doesn’t see it so. Despite being slapped with numerous court rulings that it cloned Apple’s products, Samsung is aggressively pushing its cases: A patent suit hearing in Australia is now set for March, and the firm has said it will pursue Apple’s unlicenced use of its patents in five more nations. An innovative strategy? • The Kindle Fire was “a direct assault on the iPad,” we suggested. The first reviews hit this week, just as the first consumers are getting their units. Despite generally positive reviews, the Fire is not an iPad killer–that’s roughly the consensus. It’s a different beast in a different market, acting as a doorway to Amazon’s content and not particularly slick in performance. • We said “So each of these giants will deepen their efforts to serve up media–books, music, movies, TV shows, games, and anything else that might brighten your lonely hours,” and now today Google may be coming good on its hope to deliver Google Music, an 8-year-late rival to iTunes. Deals with Universal seem in the bag, along with Google+ social sharing. But the other big labels? We’re not sure (yet). • Taking a moment to talk about HP, we noted it had “tried to take a run at Apple head-on, with its TouchPad, the product of tis $1.2 billion acquisition of Palm. HP bailed out after an embarrassingly short 49-day run and its cost ECO Léo Apotheker his job.” Apotheker’s succesor Meg Whitman yesterday had to admit to an all-hands meeting at HP that she also didn’t know what to do about a potential sale of webOS, because “it’s not obvious exactly what to do here.” As HP prevaricates, the assumed value of webOS–what’s left of Palm–must be dribbling away rapidly from that $1.2 billion total. • We called it the Great Tech War, but Mark Zuckerberg thinks differently: “People like to talk about a war…There are real competitions in there, but I don’t think this is going to be this type of situation where there’s one company that wins all this stuff.” Google is, however, “trying to build their own little version of Facebook, he conceeded. And then the search firm promptly tried to compete with Facebook Pages with…Google+ Pages. • Writing about Google’s future, we mentioned its “next victim: the TV business,” noting Rishi Chandra “described television as the most important mass medium that hadn’t yet been breached by the digital world.” Since then Google’s issued a refresh for Google TV OS, adding in new features and adding polish. But more excitingly, thanks to his biography we know that Steve Jobs himself thought he’d “cracked” the TV design problem…unleashing a slew of new Apple Television rumors. • Talking about Amazon’s Kindle Fire plans, we wondered how it could “avoid an HP-like disaster,” which was already a monstrously big PR issue then. Little did we know that the wound would still be weeping for HP this week: The beleagured firm has said it won’t spin-off its PC division after all, and there have been many hints webOS itself is doomed. • We realized Apple’s proposed Cupertino campus was going to be a big thing for Apple, literally (“a footprint slightly smaller than that of the Pentagon; its diameter will exceed the height of the Empire State Building”) and now it’s emerged that it’s going to be a big feature of Apple’s finances: Apple just issued its most recent 10-K filing which reveals capital expenditure for 2012 will soar to $8 billion–$7 billion more than it predicted back in 2009. • Since we suggested “don’t hold your breath for iTV. Of all four companies, Apple is the one that provokes the most rumors. That’s been the case for years,” another rumor has popped up. But this time it’s got real momentum, courtesy of an affirmation from the late Steve Jobs himself, and indications advanced prototyping is going on, and the former lead of iTunes is heading it up. • With the “iPhone’s launch on Sprint in the United States, and Apple’s rumored inclination to release a ‘lite’ version aimed at the prepaid cell market that’s booming across the globe,” we thought “there seems to be little standing in new CEO Tim Cook’s way.” Apple’s since launched the iPhone 4S, selling four million units in the first three days. Meanwhile, as it reported its finances, a stellar growth of 85% year-on-year disappointed Wall Sreet. • Looking at Google’s finances, we thought “Meanwhile, even in a tough economy, Google’s traditional ad business continues to produce–it’s averaging about 30% growth this year, even while its bets on the future, such as YouTube, look increasingly promising.” Google since reported its earnings, which blew past expectations with a baseline revenue growth of 37%. It’s also released Android Ice Cream Sandwich, coming on the flagship Samsung Galaxy Nexus phone, a phone bound to sell well in Samsung’s Korea. • We asked “When a company like Hulu goes on the block, these four companies are immediately seen as possible acquirers, and why not?” but now we know the answer: However attractive a target it initially seemed to prospective buyers like these folks, they found nothing in Hulu to tempt them. The firm has withdrawn itself from sale. Whatever will it do next? • Since we argued “Microsoft’s every move must be viewed as a reaction to the initiatives of these smarter, nimbler, and now, in the case of Apple, richer companies,” the time has come for Microsoft to reveal its most recent quarterly earnings. Expectations are that it’ll report revenues over $17 billion, up some 6.5% on last year’s figure. Will Microsoft achieve this, or will any growth fail to please analysts, as in Apple’s case? • Since early speculation about Apple’s upcoming voice-recognizing app dubbed “Assistant,” Apple has decided to stick with the name Siri, and made it one of the cornerstone techs of the new iPhone 4S. It’s an attack on Google’s voice-activated powers, and it’s laden with cuteness and humor that is thrilling users. Siri’s got a few limitations, still, but with TLC from Apple in 2012 she’ll be much smarter. 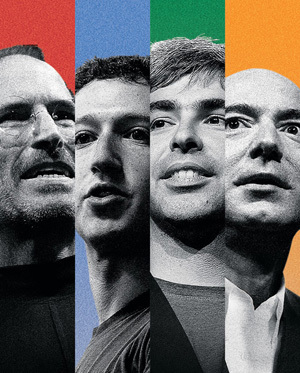 Read The Great Tech War Of 2012, from the November issue of Fast Company.